An implantable cancer vaccine being tested on patients by Harvard’s Wyss Institute is a new type of immunotherapy that holds promise to treat a wide range of cancers such as melanoma, as well as auto-immune conditions and infectious diseases. Harvard’s cancer vaccine is approaching the end of clinical testing, promising to be available 4 or 5 years sooner than Stanford’s vaccine with its 97% cure rate. 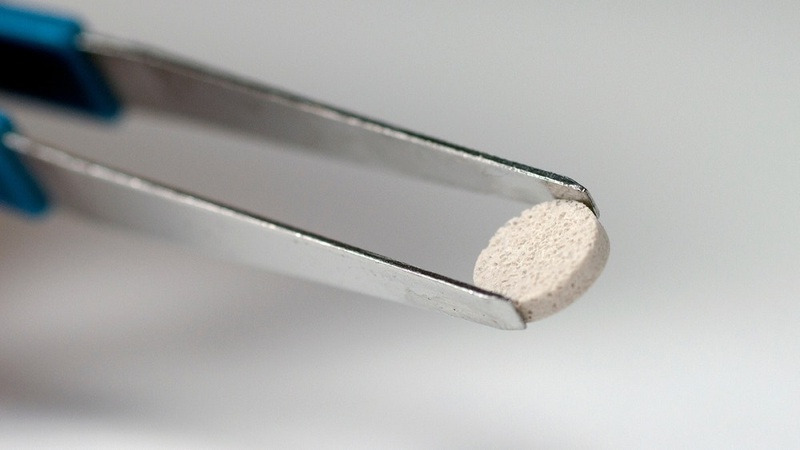 Wyss’ aspirin-sized implant is made of a polymer scaffold containing growth factors and tissue samples from a patient’s tumors which trains a patient’s immune system to search for cancer cells and destroy them. Unlike preventative cancer vaccines which a nurse injects to prevent the disease before a patient gets sick, Wyss’s new vaccine aims to treat tumors after they have already occurred. How the cancer vaccine works. Video courtesy of Wyss Institute. According to a report from Harvard’s Wyss Institute, their cancer vaccine eliminated 50 percent of the tumors in tests on mice. Half the mice treated with two doses of the vaccine enjoyed complete tumor regression. If left untreated, these mice that would have otherwise died from melanoma within about 25 days. Working in collaboration with the Dana Farber Cancer Institute (DFCI) the Wyss team is now testing the cancer vaccine in a phase I clinical trial on a limited number of patients. Getting the immune system to fight cancer is a new and promising avenue in cancer treatment. The current crop of cancer immunotherapies works by either stimulating the immune system into attacking a tumor or by counteracting the signals that cancer cells use to suppress the immune response. Treating cancer with vaccines is not a new concept, and the researchers at Harvard’s Wyss Institute have improved on a tactic which has been tried before. Mooney’s new treatment stimulates T-cells, which kickstart the immune system response when there’s a threat. CAR T-cell therapy, for example, involves extracting and reprogramming a patient’s immune cells to attack a tumor and injecting them back into the body. While extremely promising and the subject of numerous cell therapy clinical trials, CAR T-cell therapies are FDA-approved to treat only two specific types of cancer including leukemia and lymphomas. Moreover, the novel treatment is costly due to the labor-intensive preparation required. Our immune system defends us against enemies— coming from both the outside, like a virus and from within, such as cancer. The immune system uses the same mechanisms to battle both these threats; however, it is not always effective against the latter, due to an immune system which declines as we get older. The flu vaccine, for example, programs T cells to seek out and destroy the influenza virus. With flu vaccination and other preventative vaccines, nurses inject a weakened form of the virus that trains T-cells to recognize the telltale signature of the pathogen. Cancer can grow because tumors arise from a patient’s cells which the immune system fails to recognize as a threat. The Wyss cancer vaccine reprograms the immune system to attack these tumor cells. The new cancer vaccine is a spongy porous matrix which technicians implant directly under the skin near a lymph node. After being implanted, the cancer vaccine recruits a patient’s immune cells while in the body and trains them to seek out and destroy cancer through the patient. As with preventative vaccines, the treatment programs T-cells to target a specific chemical signature, and when the tumor shows up again, the immune system cells can launch a full-scale assault. The Wyss implant releases a protein called granulocyte-macrophage colony stimulating factor (GCSF) into the surrounding tissue. In turn, the GCSF attracts immune system soldiers called dendritic cells into the spongy cancer vaccine. The vaccine then reprograms the immune cells with fragments of the tumor cells, along with a signal mimicking an infection. Incidentally, researchers suspect that the beverage coffee improves brain health and wards off Alzheimer’s dementia by stimulating GCSF. After being programmed, these activated immune cells head to the nearest lymph node, where they train other T-cells to recognize tumors as dangerous enemies that need to be destroyed. While in the lymph node, the activated dendritic cells present tumor cell fragments to specific T-cells. These trained T-cells then reproduce, growing in number. After exiting the lymph node, the newly spawned cytotoxic T-cells circulate throughout the body looking for targeted tumor cells to attack and destroy. The vaccine safely degrades over time and is then excreted by the body. After killing the tumor, the cancer vaccine could also create an immune memory, providing long-term protection against tumor recurrence. With its 50% cure rate, Harvard’s new cancer vaccine is an underachiever compared to Stanford University’s vaccine, announced earlier this year, which eliminated 97% of tumors in mice. Harvard’s vaccine was tested only on melanoma while Stanford’s was tested with breast, colon and melanoma tumors. The Stanford cancer vaccine will be tested in a new human trial called the Stanford Non-Hodgkin Lymphoma Vaccine Study. The clinical trial, as well as the vaccine, is intended only for patients with that specific cancer. The human testing will be conducted by Stanford University School of Medicine in California and is limited to about 35 participants. Unlike a traditional vaccine which creates continuous immunity, the Stanford cancer vaccine carries two immune-stimulating drugs which activate the immune system’s T-cells to fight tumors. Once activated, the T-cells eliminate cancerous cells throughout the body and stop new tumors from growing. The patients in the new trial will receive radiation therapy along with the cancer vaccine during the study. The FDA has approved both drugs for use on people. The researchers reported minor side effects fever and sores at the injection site while testing the cancer vaccine on mice. As with all phase I trials, Stanford’s new trial aims to look at the safety of the novel cancer vaccine. It will be at least a few years before the FDA could grant final approval, depending on the outcome of the clinical trial. Harvard’s cancer vaccine has an advantage over Stanford’s offering – it started in clinical trials 5 years ago and should be available that much sooner. The Phase I clinical trial of Harvard’s cancer vaccine began in 2013 to test its safety in patients with a lethal form of skin cancer called melanoma. With the current standard of care, metastasized melanoma has a 4% survival rate. The trial is still ongoing with many of its original patients and is headed up by F. Stephen Hodi, Jr., M.D., Director of DFCI’s Melanoma Center and Professor of Medicine at Harvard Medical School. Wyss’s approach has other advantages as well. The implantable technology is applicable to a broader variety of tumors. Aside from therapeutic applications, the implantable technology could also be used to treat infectious diseases as well as a diagnostic to identify auto-immune diseases. Cancer is age-related disease, and the odds of getting it increases every decade of our lives. About half of those living in industrialized countries will develop cancer during their lifetimes, usually after the age of 40. While researchers are not exactly sure, they suspect that tumors are caused by genetics, a weakened immune system, DNA damage, and exposure to cancer-causing chemicals in our environment such as those from water and air pollution, cigarette smoke or other toxic chemicals. Organizations such as the American Cancer Society say that more than half of all cancers can be prevented by avoiding these toxins, and by refraining from smoking, and adopting a healthy diet, proper body weight and exercise. As well, a report published last month linked higher levels of vitamin D to reduced cancer and an earlier observational report suggest that the drug metformin prevents cancer. Moreover, a recent article by the World Health Organization says that vaccination against cancer-causing viruses could prevent 1,000,000 cases of cancer each year. The immunosuppressant drug rapamycin delays the incidence of cancer in mice and researchers are testing it as a cancer treatment in humans. Doctors are concerned about rapamycin’s adverse effects, when taken by healthy people to slow aging and ward off cancer, including insulin resistance and a suppressed immune system. A clinical trial suggests that intermittent rapamycin therapy reduced these side effects, however, these results await a larger and longer trial for confirmation. Researchers also suspect that our aging immune system explains the rise in cancer. Our thymus – the small gland just behind our chest – produces the bulk of cancer-fighting T-cells in our youth and begins to shrink in puberty. Researcher Greg Fahy believes regrowing our thymus and restoring its function will help ward off cancer. Regrowing the thymus using Fahy’s method requires frequent injections of Human Growth Hormone (HGH), a controversial practice suspected of increasing the risk of type 2 diabetes and cancer. Preventing cancer is our best defense. Meanwhile, scientists from Harvard, Stanford, and many other institutions are moving us ever closer to improved treatments for this dread disease. Cover Photo and video courtesy of the Wyss Institute. Diagnosis, Treatment, and Advice: This article is intended for informational and educational purposes only and is not a substitute for qualified, professional medical advice. The opinions and information stated in this article should not be used during any medical emergency or for the diagnosis or treatment of any medical condition. Consult a qualified and licensed physician for the diagnosis and treatment of any and all medical conditions. Experimental cancer vaccines carry a much higher risk than FDA-approved ones. Dial 9-1-1, or an equivalent emergency hotline number, for all medical emergencies. As well, consult a licensed, qualified physician before changing your diet, supplement or exercise programs.